We are well aware of the challenges and issues of the informal carguards on 4th avenue since we have received various complaints from residents, we are investigating various solutions and will feedback to residents. We need to be mindful that security solutions cost money, the more sign ups we receive the more opportunities we have to combat crime. -Vehicle theft occurred on 7th street, a silver Toyota Yaris (Reg no: CA630917) was parked outside the resident’s premises when it was stolen by unknown suspects. -Hijacking of a Range Rover was reported on SAFEPARKS/PARKSEC whatsapp security group, CORTAC responded with NETSTAR tracking only to find that the tracker was disconnected and thrown in the Spruit on 22nd street with no vehicle in sight. – Vehicle theft occurred on 7th street near the restaurants, the visitor parked and went to 4th avenue to meet for dinner, a silver Toyota Corolla (Reg no: RTD930GP) was stolen. 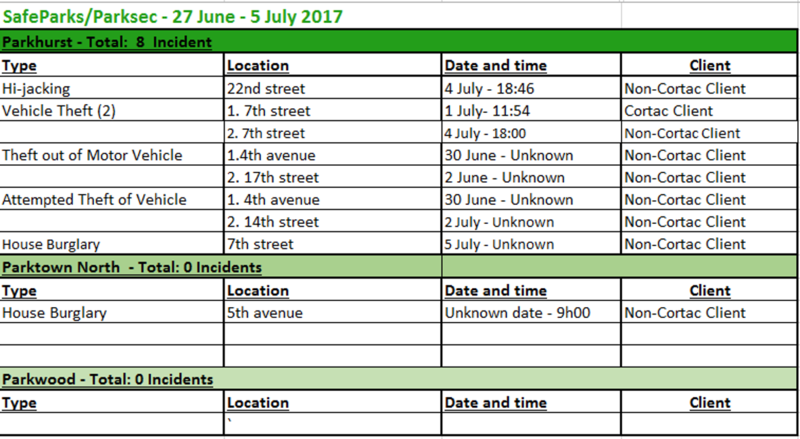 -All other crimes reported above were reported to SAPS during the reported period and no further details are available. – All other crimes reported above were reported to SAPS during the reported period and no further details are available. – Please be alert of Dunkeld Shopping Centre, various crimes of vehicle theft, theft out of motor vehicle and car jamming as been reported to SAPS, it is currently a HOTSPOT! “Your guys are really terrific. When I move, I will definitely want to employ CORTAC as my security company due to the service, promptness and kindness of your security officers. I once again have to mention the extra assistance I got from four of your officers. The outside light at my gate was no longer working and two of your guys assisted me Tuesday night – I unfortunately did not get their names – and helped me to unscrew and dismantle a rather complicated light cover. In all my encounters with Cortac your officers have been so helpful and just truly amazing – always willing to assist and go the extra mile, or take another walk around the house when I needed reassurance.